5th LoCARNet Annual Meeting was held in Bandung, Indonesia co-organised by ITB, IPB, NIES, MOEJ, MOFA and IGES on 25th – 26th October 2016. About 84 people including researchers, government officers and NPO staffmember participated in the meeting. In this meeting, with the theme of “Carrying out the Paris Agreement: Role of research communities in supporting science-based climate policy”, the lively discussion on urgent issues in Asia, such as; Low Carbon City, Inovative monitoring system, Land use, adaptation, formulate and implementation of NDCs and Capacity building method, was made by experts of research sector, government sector, public sector and international organizations who were gathered from each countries in Asia. In this Annual Meeting, participants could share the knowledge about policies or environmental investments in Asian countries/cities, and also could promote the dialogue among the variouse stakeholders including researchers, policy makers, public sector and international organizations. 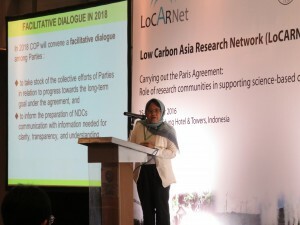 LoCARNet has organized capacity buildings or annual meetings since it was establisehd on the purpose of strengthening and training of research communities based on the features of the Asian region. During the Annual Meeting, “Seminar for Capacity Development for Transparency to Implement the Paris Agreement” was held sponsored by the Ministry of Foreign Affairs Japan as one parallel session. Total 37 participants from 6 countries and 1 international organization discussed about what the necessary capacity building should look like in order for developing countries to fulfill the obligations they have newly taken on under the Paris Agreement. PS5-7 Toward realizing 2oC/1.5oC target: Why deep decarbonization is required and what kinds of pathways can achieve it?